The Nintendo Wii is the most popular gaming system right now, and because of its design it lends itself to a lot of different accessories. Having all of these extras is helpful, and can improve game play, but can get expensive quickly! The good news is that there are a lot of different Wii bundle options that will get you everything that you need, and save some cash along the way. 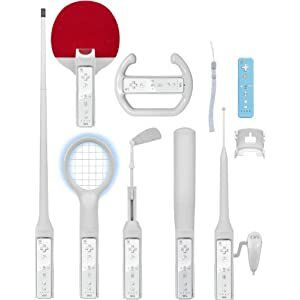 However, not all are created equal, so I want to share some of the best Wii Accessory bundles so you can get exactly what you need for the games you have/want. For the games Wii Sports, Wii Resort, and Mario Kart Wii, the 9 In 1 Sports Pack by CTA is the best choice. It comes with a Wii wheel (for Mario Kart), and for Sports and Resort is has a baseball bat, tennis racket, ping pong paddle, fishing rod, golf club, and pool cue. The last two accessories in the bundle are a plastic cover for the Wii Mote and an extra wrist strap. These games aren’t the only that use the sports equipment included in this bundle, but they are the most popular. Rather than trying to share the sports gear among the family, or leaving someone without a steering wheel or bat, check out the 15 In 1 Family pack by Intec. It comes with a pair of each accessory, so you can play two player for all of the Wii Sports/Resort games. It also comes with their version of the Wii Zapper. Wii Fit’s Balance Board has a ton of accessory bundles that are available. For the ladies, check out the 5 In 1 Workout Kit by DreamGear. It comes with a silicone cover for the balance board, a rechargeable battery pack, a pink yoga style mat for the board to rest on, a travel bag, and a pair of textured socks that will make sure that you don’t slip off of the board. They also make a more gender neutral version of this kit that comes in the Wii Fit green color. Getting the most from your Nintendo Wii means that you have all of the necessary accessories. It’s difficult to wade through all of the options, while figuring out how to save money on it all. Use the bundles that are discussed above to get the most good stuff for the least amount of cash.